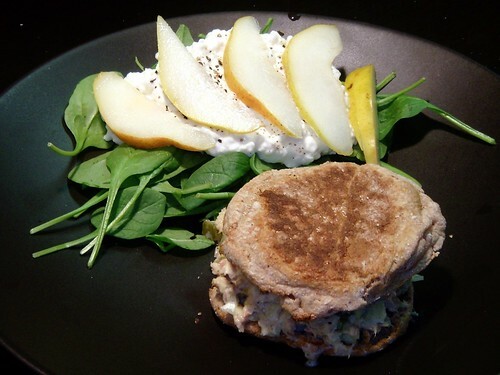 tuna salad on wholewheat english muffin with baby spinach cottage cheese and pear salad , originally uploaded by aarn! +10th November, 2008+. made some tuna salad with a little homemade mayonnaise, onion, garlic, mustard, pickles, salt and pepper. put it on some toasted whole wheat english muffins. served with some baby spinach, topped with cottage cheese and some slices of bosc pear.